Everything is going to be roses right? Sorry sweetheart. Life with an Ostomy isn’t always smooth sailing. You have Crohn’s Disease. What they don’t always tell you, probably because it’s bad enough you’ve been diagnosed with one disease, is that you don’t get excluded from every other disease, virus or symptom! They do usually tell you that it’s not an “if” but “when” you will be having surgery to remove your diseased bowel. For me at 15 my doctor told me this. 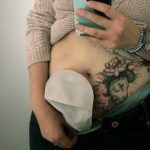 He did warn me that I wouldn’t ever just have one surgery and that was the only reason they wanted to wait until it was absolutely necessary to remove the diseased bowel. But I’ve also had a few things go right post surgery! I’ve stayed mostly in surgical remission!! Yay! And then there are the shi**y experiences with a bag… The main thing is how you deal with those moments! You just have to laugh! You just have to have your little tantrum and move on! I’ve had times that my damn bag just doesn’t want to stick! I’ve had moments where I was sent the wrong products and went on my honeymoon to Greece and it wasn’t until I was there that I realized that I had been given the wrong bags!! I’m pretty sure my hubby has never seen me throw an epic tantrum like I did that day!!! Can you blame me though?!! After my (deservedly so) meltdown, I was able to find where I could get some more supplies! I was lucky that I had lived in Greece previously so spoke the language enough to get by and knew that I could get some from the city! Phew! I’ve been on the London Tube and my bag has sprung a leak! I have wrapped myself in cling wrap after a leak because I forgot enough supplies and had to drive an hour with poo against my skin and eating my flesh – that took 2 days to heal! I think I cried those 2 days straight! I have pulled my clothes off and my bag along with it as I stepped into my bathroom and my bag has landed on the tiles, thankfully, but the poo has ended up the cupboards and walls. All I could do was laugh, take a picture and send it to my hubby. All I could think was, where the heck was I going to start?! So how do you deal? What helps you get through all the “shi**y” times? My motto is, I am entitled to have some severe and maybe not so together moments along the way and most of all, I am going to have them, I’m going to have them loudly and proudly because I have freaking earned it!!! The most important part is that I will have them and then I will pick myself up and get this sh*t done! Sometimes you just have to cry it out and that’s okay. Like you say, I think we are entitled to some severe tantrum moments. Let it all out and then put your game face on and be the warrior that you are.